LIBERAL, Kan. – The Seward County Lady Saints open up conference play with a 8-1 win over the Barton Cougars at home! The ladies start conference play undefeated and are 6-2 overall for spring play. The Saints fell hard in the final match last weekend with a 0-9 loss against #1 Tyler and the Lady Saints regrouped and came out to win against the Cougars. Starting with doubles, first to finish was Megan Petr and Yursa Hegy at No.3 and easily took care of Thamires Lima and Ksenija Dmitrovic 8-2. Next was No.1 pair Patricia Panta and Steffany Bermundez who won 8-3 and final to finish was No.2 team Alena Macharova and Maria Aveiga who won 8-1 in long rallys. Going into single play, the Lady Saints led 3-0 overall. First to finish was No.6 Petr who won her game quick 6-2, 6-0 against Lima. No.5, Hegy finished in a super tiebreaker and she came out on top 2-6, 6-2, 10-5 playing Jenna Groene. Next was No.4 Bermundez who won 6-0 both matches. The final three to finish was No.1 Panta after long rallys she won 6-4, 6-2 over Bartons No.1 Neus Torregrosa. No.2 Aveiga finished shortly after winning 6-0, 6-2 and was the final match of the day. No.3 Macharova defaulted her game which gave the Lady Saints there only lost match on the day. 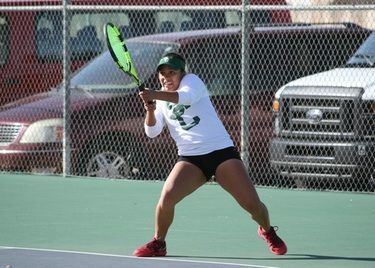 Seward County Lady Saints will play this Wednesday at home again at 1:00 pm against Southeastern Oklahoma State at Bluebonnet Park.